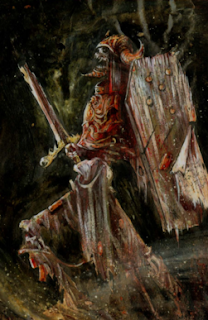 Skeleton Warriors are, as their name implies, skeletons that have been raised from their graves to fight, willingly or not, on the behalf of the Necromancer who raised them, forming the overall backbone of most Undead armies under the control of the Vampire Counts. For thousands of years, armies have marched and fought across the Old World since the time of its creation. There is barely a field, hill or valley that has not seen fierce fighting at some point in the past. Going as far back as the reign of Sigmar Heldenhammer and even earlier, these great battles have left many unmarked and unblessed graves scattered all across the world. Natural Roll of 16+: Add the escalation die to damage. Black Arts : When hit by an attack with a Natural Odd Roll, they take half damage.